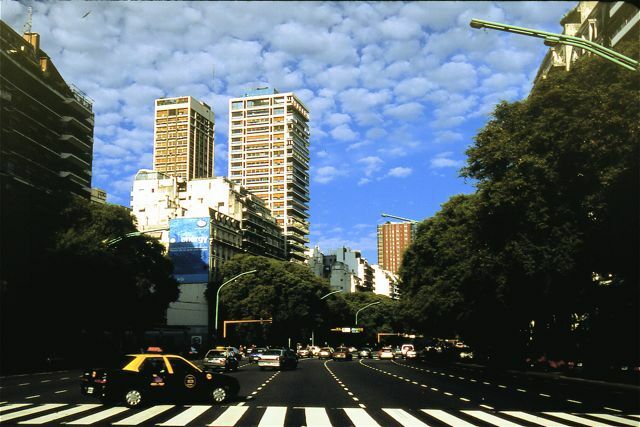 I’ve written several times about Argentine traffic safety in Buenos Aires and elsewhere, suggesting that the first rule of pedestrian survival is to appreciate that you are invisible, but it’s a topic that never seems to go away. 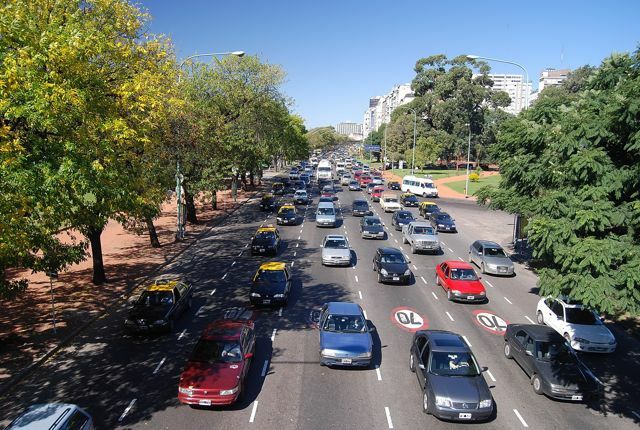 Only a few days ago, the daily Clarín reported that pedestrian deaths in the Argentine capital have are running roughly 50 percent ahead of last year, with an average of five per month. City buses and trucks are the usual culprits. According to Alberto Silveira, of Luchemos por la Vida (an NGO whose slogan is “road safety is no accident”), part of the problem is inadequate infrastructure: removing buses from narrow streets, turning others in pedestrian malls, and widening sidewalks would make the city safer. In the colonial barrio of San Telmo, some sidewalks are only 60 cm wide (barely two feet). 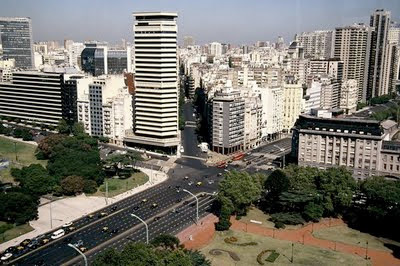 Silveira also suggests closing some streets to through traffic and installing speed bumps, though my own anecdotal observations would suggest that the speed bumps are ineffective - many Porteño drivers don’t hesitate to fly over them. On the other hand, in my own Palermo neighborhood, I’ve seen a few blocks with speed dips - in reality, gutters that help drain waters in heavy storms but are also effective in slowing drivers who don’t want to scrape the undercarriage of their vehicles. One taxi driver there told me it keeps everybody honest. These infrastructural solutions, though, are much easier to implement than changing the habits of Argentine drivers, few of whom would ever consider yielding right of way to a pedestrian. 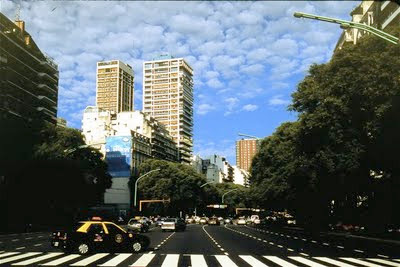 The Clarín story notes that “the buses that come down Avenida Córdoba turn onto Cerrito at full speed, without respecting pedestrian priority and forcing them to sprint across.” Even the young and agile can find crossing 12-lane Avenida Libertador (pictured above and below) a challenge and, according to one traffic study cited by Luchemos, there are more than 700,000 violations of pedestrian right of way in the city every day. In a month, that totals more than 21 million, but leads to only 39 citations - an average of roughly one for every 540,000 violations. There is, of course, the issue of pedestrian culpability. While it’s true that many ignore traffic signals and even cross mid-block, I’ve always thought that, given the habits of Argentine drivers, pedestrians have to try to cross wherever it’s feasible. That said, contemporary technology is now a contributor to the hazard - pedestrians texting on smartphones certainly bear responsibility when they stroll obliviously into the street, even if cars and buses are far more lethal. In theory, pedestrian violations are subject to citations and fines, but those are even rarer than moving violations for vehicles. Speaking of moving violations, those should in principle become more common, as the Buenos Aires city legislature reduced speed limits for public buses last month: from 80 to 60 km per hour in major avenues, and 60 to 50 km per hour in other avenues. Unfortunately, the limit on normal streets remains 40 km per hour, rather than dropping to 30, and the new law does not apply to passenger automobiles. Even then, bringing down the death toll would require serious traffic law enforcement - the factor that is most lacking. 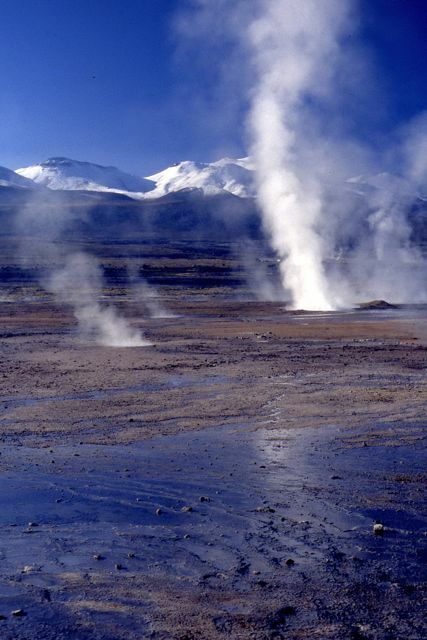 Today’s entry offers practical information on Chile’s ongoing volcanic eruption, which is disrupting travel in Argentina and even around the globe, plus coverage of Eva Perón’s jewelry and Bolivian president Evo Morales’s self-appointed status as a TV critic. To this point, the Volcán Puyehue-Cordón Caulle eruption has been mostly ash and pumice, blanketing parts of nearby Argentina - most notably the scenic lakeside resort of Villa La Angostura - in a dry rain that’s collapsed houses, paralyzed transportation, and killed livestock that can’t find forage. 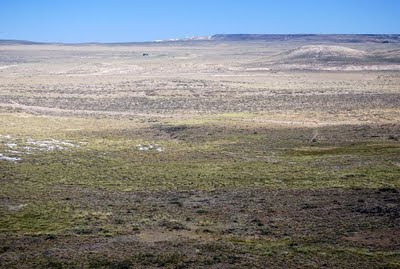 Argentina’s federal government has declared Neuquén province a disaster area and now, according to Montevideo-based Mercopress, Chile’s Servicio Nacional de Geología y Minería (Sernageomin, National Geology and Mining Service) reports that a “cork” of lava in the caldera could trigger an explosive event. 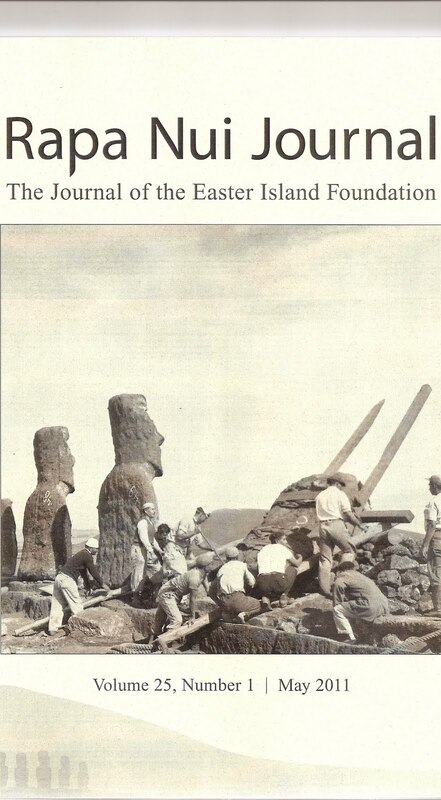 It is currently under red alert; the lava flow in the photograph above dates from the 1960 eruption. According to LAN Airlines, its Chilean domestic flights to southern destinations (including nearby Puerto Montt) as far as Punta Arenas are operating normally. The luxury Termas de Puyehue hot springs resort (depicted above) - virtually in the shadow of the volcano - claims to be “operating totally normally,” even though Sernageomin has indicated the possibility of lahars in the nearby Río Golgol drainage. The Argentine side, though, is a different story - Bariloche’s airport, in particular, is off limits, though the Buenos Aires Herald reports that service to the southern Patagonia cities of Río Gallegos, El Calafate and Ushuaia has recommenced. Eva Perón always claimed that she and her husband, President Juan Domingo Perón, had the best interests of the Argentine people at heart - at least, those who were not part of the “oligarchy.” A couple days ago, police recovered US$9 million worth of the late first lady’s jewelry, including a tiara that was a gift from Dutch royalty before her death in 1952, that would seem more appropriate to an oligarch (For what it’s worth, Holland’s current Princess Máxima Zorreguieta is an Argentine who would definitely satisfy Evita’s standards for an oligarch). 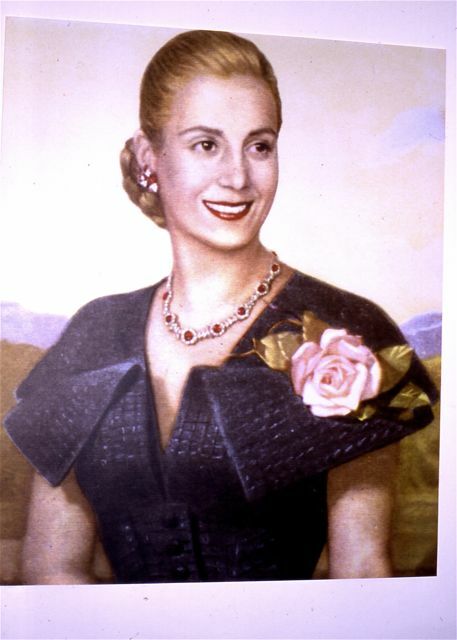 Stolen from a Spanish jeweler in 2009, Evita’s baubles were recovered in a joint Spanish-Italian operation in the city of Milan - appropriately enough, the city where Argentine military dictatorships and their successors hid her corpse, in an unmarked grave, from 1955 to 1971. Everywhere, except in true dictatorships, it’s common for the government and the press to have an adversarial relationship - following the lead of her late husband/predecessor Néstor Kirchner, Argentine President Cristina Fernández has an ongoing feud with the country’s two main dailies, the conservative La Nación and the centrist Clarín, for presumably unfair coverage. 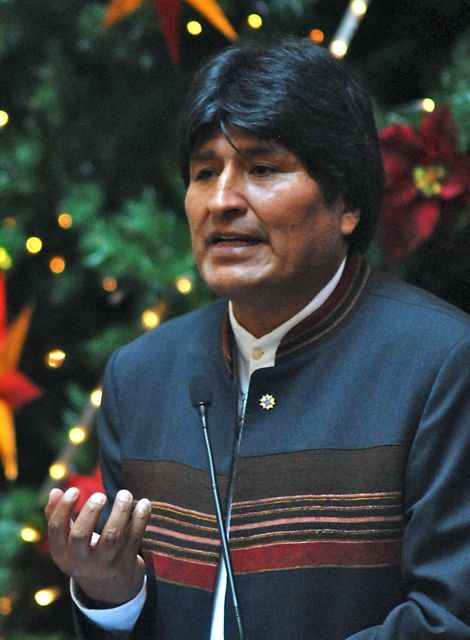 Bolivian president Evo Morales, though, may have set a new standard for media criticism, having blamed telenovelas (soap operas) for at least 60 percent of the country’s divorces. Morales (photograph above courtesy of Agencia Brasil), an ideological ally of Venezuela’s Hugo Chávez, has deepened his criticism to castigate action movies as a major cause of violent crime: “My point, although others might jeer at me or bait me, is that those films about violence and terrorism, that cause family problems, should be banned.” Then, of course, all will be well in this almost stereotypically unstable country (which, in fairness, seems a better place today than it was under an endless succession of military regimes that, when I met my Argentine wife there in 1981, enforced a 10 p.m. curfew throughout its territory). Today’s entry covers a series of recent items on Easter Island, the lingering effects of Volcán Puyehue, the HydroAysén controversy, and the world’s greatest lemonade (by volume; I’ve not been able to taste it). 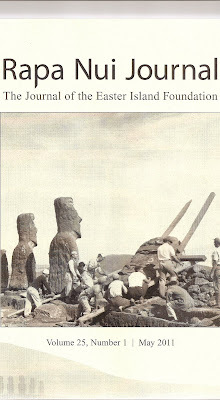 Things are changing fast on Easter Island. 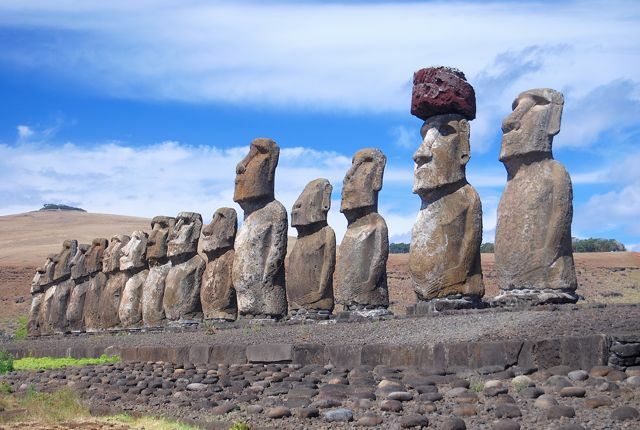 As I wrote a few months ago, Conaf (Chile’s national parks agency) has instituted a new annual pass (around US$20) that applies to all of Chile’s parks except, unfortunately, Torres del Paine and Rapa Nui. Now we learn that Conaf has instituted a new policy by which every passenger arriving at Hanga Roa’s Aeropuerto Internacional Mataveri will be required to purchase a wristband (US$20 for Chileans, US$50 for foreigners) to visit Parque Nacional Rapa Nui. 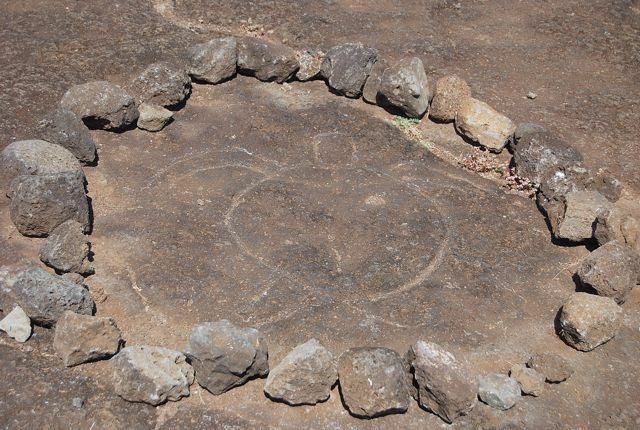 The passes will be valid for five days for all sites except the Orongo Ceremonial Village and the Rano Raraku quarry (pictured above), where all the island’s signature moai came from. Previously, those were the only archaeological sites where any charge was collected, and the new pass will entitle visitors to a single visit only to each site. I’m personally ambivalent about such charges, because I dislike the differential charges for Chilean nationals and foreigners, as it simply assumes foreigners are more able to pay them. 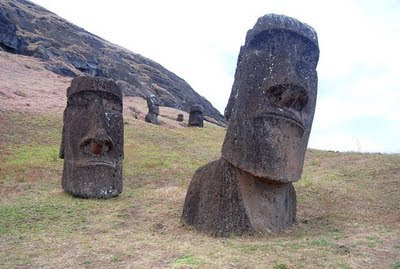 On the other hand, given that Easter Island is a relatively remote destination that’s expensive to reach, it’s hard to imagine that the fee difference would be a deal-breaker. The ashfall from Volcán Puyehue continues circling the planet and, as of yesterday, it disrupted flights from South Africa’s Cape Town International Airport. 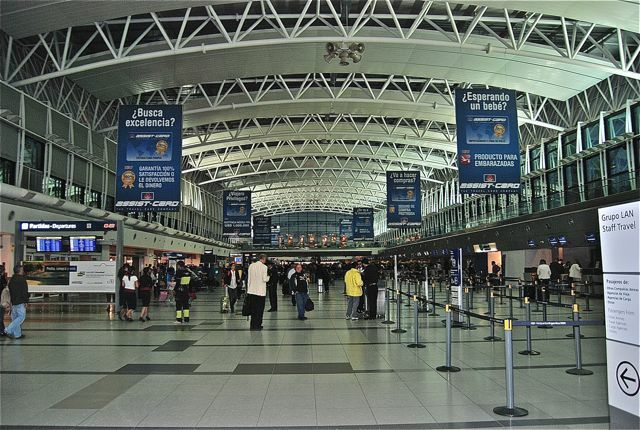 LAN Airlines, however, has announced the resumption of flights from Santiago to Auckland and Sydney, though its Argentine domestic operations to the airports of Bariloche, Neuquén, Comodoro Rivadavia and Río Gallegos remain suspended. The Chilean government is permitting evacuees to return to the Puyehue area, where their fields are covered in ash, but the worst victim of the ashfall appears to be the Argentine resort town of Villa La Angostura (where NBA basketball star Manuel Ginóbili has a home; pictured above before the eruption). 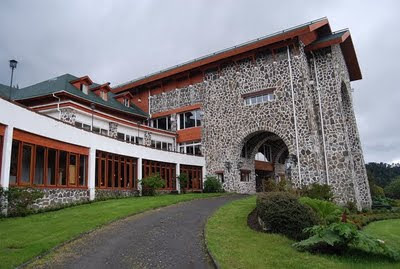 From photos I have seen, Villa La Angostura is blanketed with ash, while the telephone service has collapsed; the central government has sent five million pesos (about US$1,250,000) in short-term assistance. 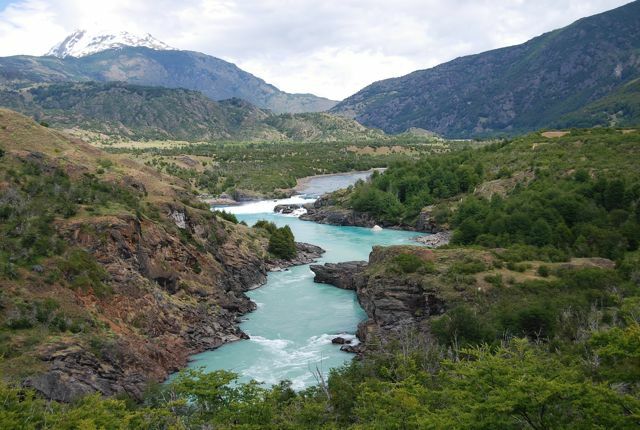 Following its approval by a government commission last month, the controversial HydroAysén dam and power project in wildest Patagonia (including the Río Baker, pictured above) has hit a judicial obstacle. 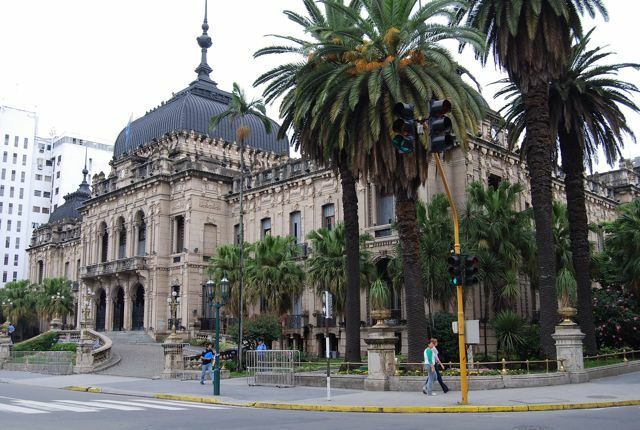 An appeals court in the city of Puerto Montt has granted an injunction against HydroAysén pending resolution of a series of complaints from lawmakers, municipal authorities, and environmental groups. 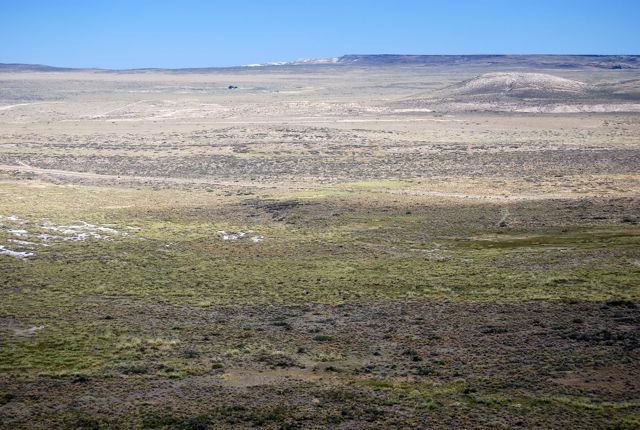 It is also possible that a number of local land-use referenda currently in progress in the thinly populated Aysén region could prove to be additional obstacles for the company. Best known as the cradle of Argentine independence, the northwestern city of San Miguel de Tucumán (pictured below) is where delegates to the Congreso de Tucumán declared themselves free of Spain in 1816. 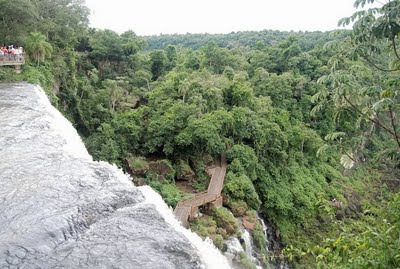 Though it enjoys mild winters, for much of the year it’s a hot, humid subtropical city that was long renowned for its sugar mills. 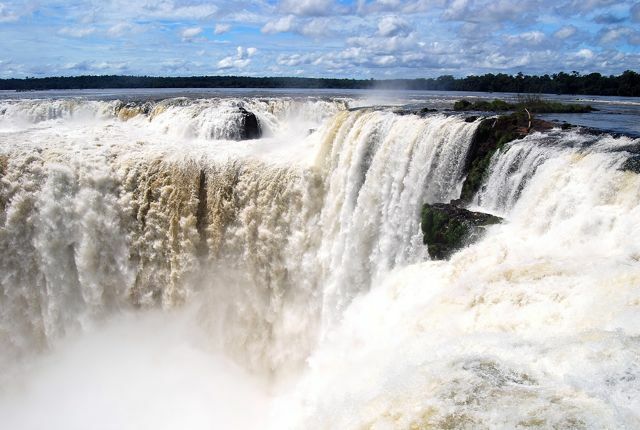 According to the Buenos Aires daily Clarín, though, Argentina is now the world’s largest lemon producer - a fact I did not know - and, on Sunday, Tucumán residents made the Guinness Book of World Records by producing the world’s largest lemonade. The relevant stats: 30,000 lemons, 1,100 liters of fresh-squeezed lemon juice and 470 kg of sugar to produce 5,500 liters of lemonade - breaking the previous record of 4,359 liters in the United States. 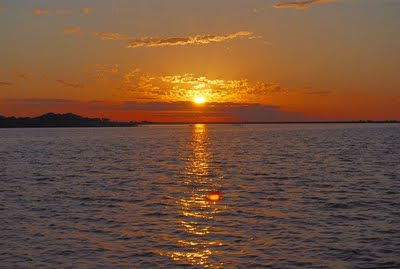 With high temperatures only around 15° C (roughly 65° F), Tucumanos might do well to save some of it for summer, when the mercury routinely climbs above 30° C (86° F) with Floridian humidity. After writing three separate posts about the eruption of Volcán Puyehue, which remains on red alert, I’m suffering from volcano fatigue. 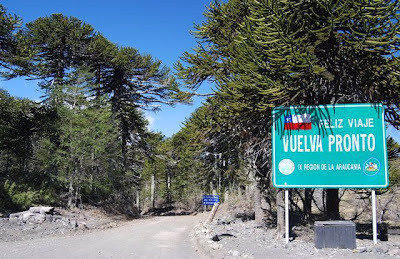 Since southern Chile and Argentina are lesser winter than summer destinations anyway, I’ll use today’s post to make suggestions about ash-free travel in the northern deserts and moist forests and wetlands of the two countries, where it’s presently possible to make air connections from Buenos Aires and Santiago, where international airports are once again open. The destinations that follow are actually better in winter, when milder temperatures are the rule. 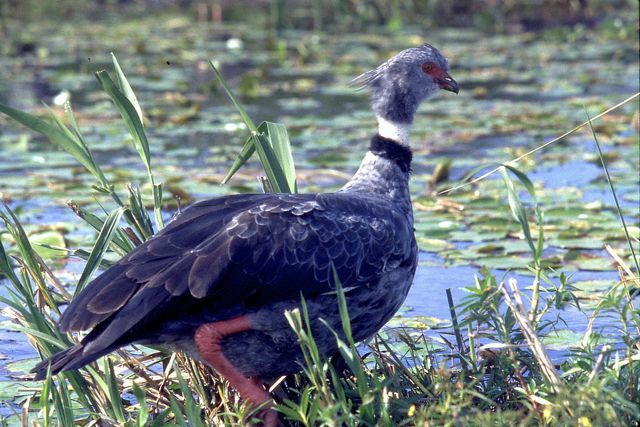 Perhaps the most underrated destination in all of Argentina, the Iberá marshes of Corrientes province are a cornucopia of subtropical wildlife, where it’s possible to come face-to-face with caimans, capybaras, howler monkeys, marsh deer, and perhaps even a maned wolf - not to mention nearly 350 bird species. 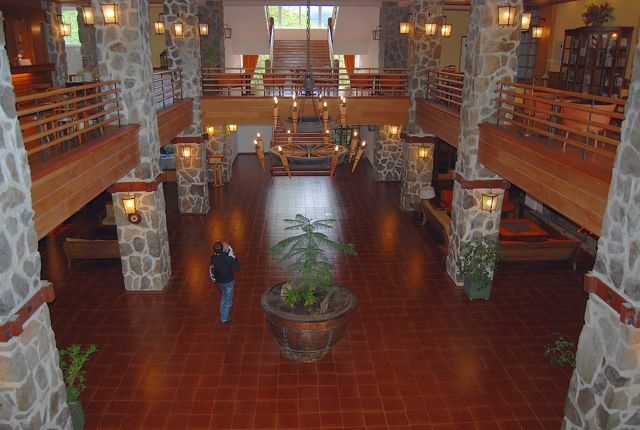 Estancia Rincón del Socorro offers expensive luxury tours and accommodations, but nearby Colonia Pellegrini offer alternative services for every budget from shoestring backpackers up. Unlike Iberá, the Iguazú falls are world-famous, even appearing in commercial cinema epics such as Moonraker (1979), The Mission (1986), and Indiana Jones and the Kingdom of the Crystal Skull (2008). Recent theme-park transformations have made visiting the falls a less adventurous experience than it once was, but there’s no denying the visual and aural impact of thunderous whitewater that plunges vertically over a basalt escarpment half again as high as Niagara, and more than twice as wide. It’s also a UNESCO World Heritage Site. Like Iguazú, the Humahuaca canyon is a UNESCO World Heritage Site, for its imposing natural landscapes, archaeological sites, and an indigenous heritage that recalls the Four Corners area of the southwestern United States. At its highest altitudes, winter nights can get cold, but July and August are warm and dry during the daytime. 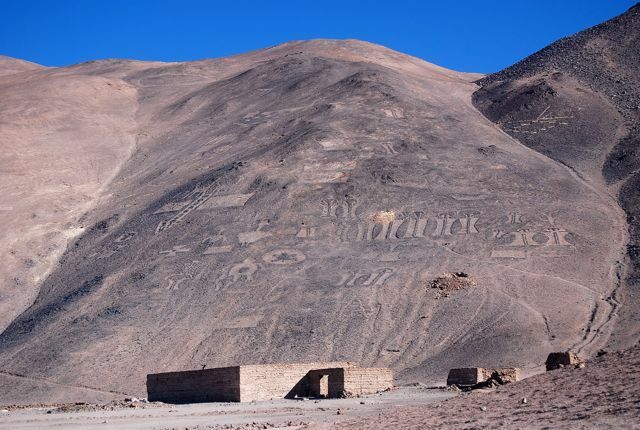 The capital of Chile’s Tarapacá region, the coastal city of Iquique has a mild dry climate all year - even as the winter solstice approaches, the forecast daytime temperatures for the coming week are in the mid-60s (around 18° C). 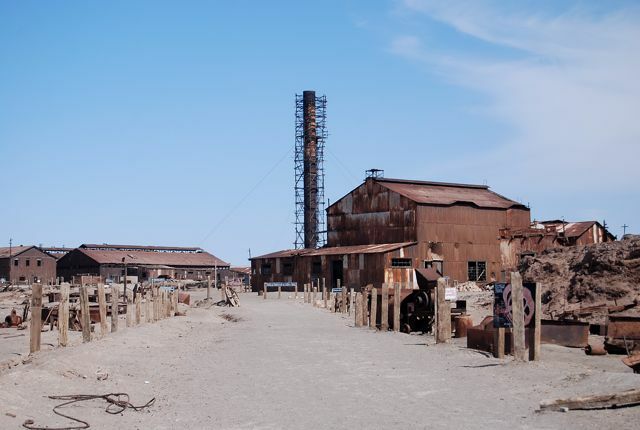 That may not be warm enough to swim in the chilly Pacific - though wet-suited surfers enjoy big winter waves from storms at sea - but it’s warm enough to enjoy the city’s Victorian architecture, the nearby nitrate ghost towns of Humberstone and Santa Laura (another UNESCO World Heritage Site, pictured above), and the pre-Columbian geoglyphs that cover the hillsides of the Cerros Pintados. The best-known destination in the Atacama desert, San Pedro is a genuine colonial village that’s also become a magnet for travelers ranging from full-moon party-goers to the most selective of those for whom cost is no object - at the all-inclusive Hotel Awasi, for instance, the guest to guide ratio is one to one. 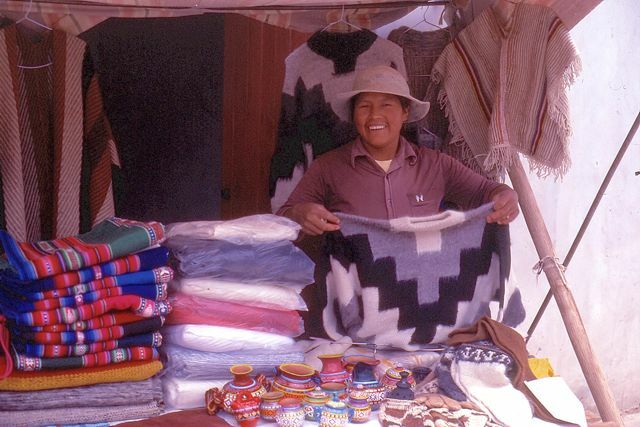 Like Iberá, though, San Pedro also offers cheap to moderately priced alternatives for everybody to visit sights such as the frigid but flamingo-filled lakes of the altiplano, the geyser fields at El Tatio, and pre-Columbian ruins at Catarpe and Quitor. 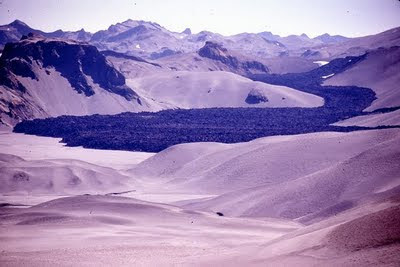 “Fortunately, INTA Bariloche has taken quick action and, taking advantage especially of the experience gathered in 2008 when the Chaitén volcano erupted and sent its ashes into Argentine Patagonia, sent out three different reports on the situation, including definite recommendations for the growers, with practical advice how to cope with the situation.” Among other problems, the ash wears down the teeth so that sheep cannot feed properly, even when forage is available. 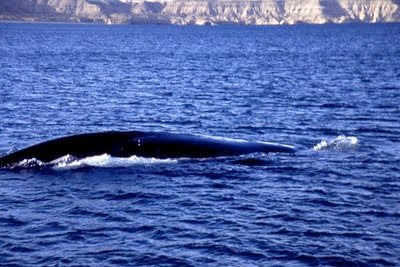 On the Chilean side, according to Montevideo-based Mercopress, Sernapesca Director Guillermo Rivera said that the eruption killed more than 4.5 million fish in the Río Nilahue, which descends from the north slope of the Cordón de Caulle into Lago Ranco - whose temperature rose to 113° F - briefly, at least, thus huge glacial remnant experienced hot springs temperatures . 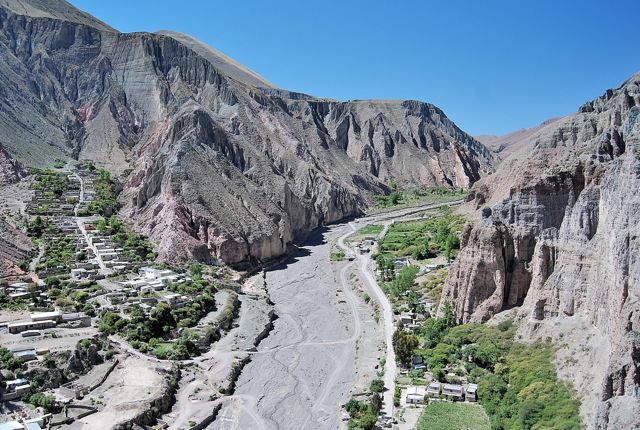 Some evacuees, though, have been allowed to return home and, again according to Mercopress, repairs of the road across the Paso Cardenal Samoré have commenced. On the Argentine side, Jane Williams of Estancia Huechahue, which specializes in horseback trips in Argentina’s Neuquén province but also hosts fly-fishermen, reports that “we have some ash but no more than Esquel got from Chaiten, and they say the fishing was great there that year!” On the Chubut coast, a press communiqué from the town of Puerto Pirámides claims that, “despite the so-called rain of ashes that affects a large part of Chubut province, all services at the town of Puerto Pirámides are operating normally, particularly whale-watching, accommodations, restaurants and overland transportation.” What this doesn’t mention, of course, is the difficulty of getting to the nearest airport, at Puerto Madryn or Trelew, to be able to visit Península Valdés. Even presuming you can get to Buenos Aires, the overland trip to Chubut is a long one. 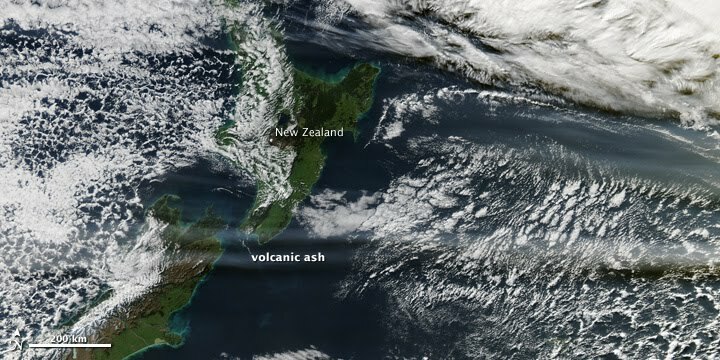 In its weekly update, the Smithsonian Institution’s Global Volcanism Program has given the most succinct summary yet of the eruption at Chile’s Puyehue-Cordón Caulle Volcanic Complex, which began on Saturday and continues, with changing winds, to blow ash and pumice into Argentina even over Buenos Aires and into the Atlantic Ocean. 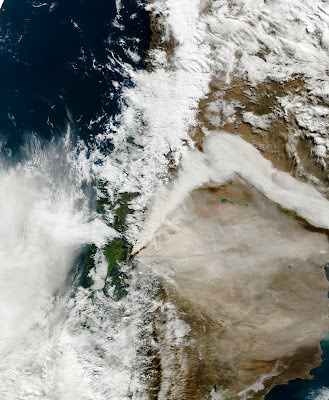 The striking NASA photograph below shows the plume from the volcano as it blew southeast from the caldera toward the city of San Carlos de Bariloche - as this is cropped from a larger image, no scale appears, but it stretches about 75 km from northwest to southeast. 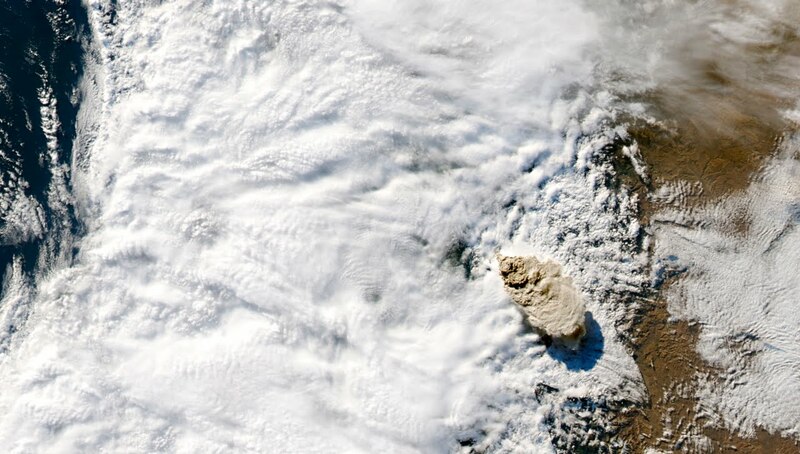 That, of course, is the view from space, but it tells us little of what’s happening on the ground. Only recently have I heard from friends directly affected on the Argentine side of the border, and I’ll use this post to pass on a few of their stories. Bariloche-based Macarena Pérez Correa, a GIS specialist (and friend of mine) who produces a series of excellent maps of Patagonia and elsewhere, was on the Isla Grande de Chiloé when the eruption occurred. 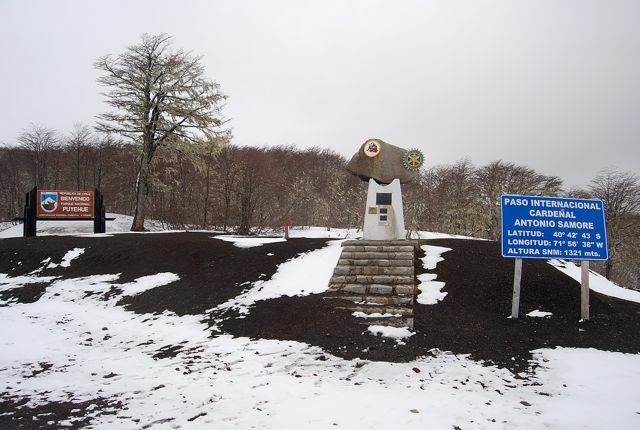 Finding her usual border crossing from Osorno to Villa La Angostura closed, she had to detour north to Pucón, cross the border at Mamuil Malal (pictured below, it's Paso Tromen to Argentines) and then continue south to her home - a detour of nearly 600 km. In the city of Neuquén, meanwhile, Gustavo Gil wrote me that the “ash started falling Monday afternoon, a fine gray dust that became more pumice-like, covering the cars and the streets, and they've closed the airport for three or four days.” My own guess is that it will be significantly longer - the body of water in the image above is Lago Barreales, a reservoir northwest of the city. In Buenos Aires, Joaquín Allolio (Macarena’s father-in-law) tells me there’s no ashfall, with a cloud passing over the city yesterday, but that the situation is changing by the moment. 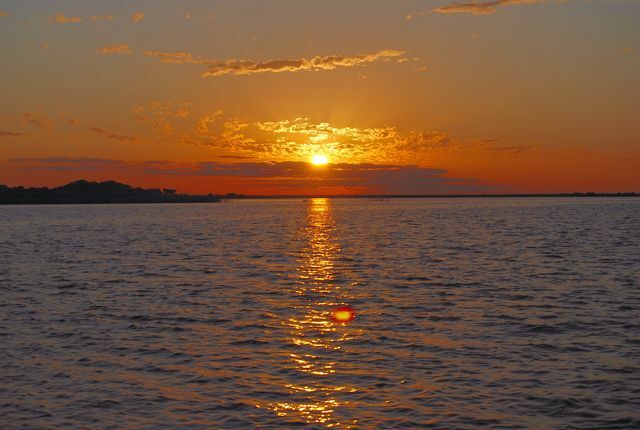 According to Mercopress, all flights out of Buenos Aires and Montevideo are suspended until further notice, with the cloud of ash moving over the Río de la Plata at about 12,000 meters. Airports at Bariloche, Chapelco (San Martín de los Andes), Esquel, Trelew, Neuquén, Viedma and Bahía Blanca remain closed. 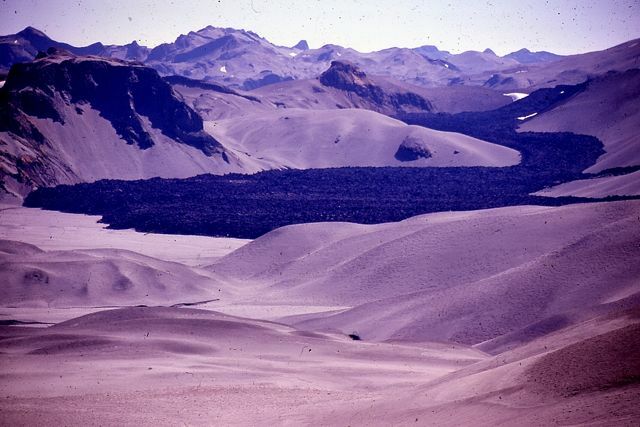 In 1979, when I first visited Chile, one of my most memorable excursions was an overnight trek to the slopes of Volcán Puyehue, a stratovolcano that, as part of the Puyehue-Cordón Caulle Volcanic Complex, produced a massive 1960 eruption shortly after the historic Valdivia earthquake (at 9.5 on the Richter scale, the most powerful ever recorded). 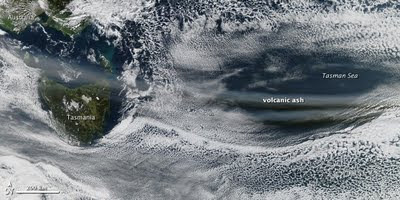 Continuing for two months, that eruption (depicted in the NOAA photograph above) left a landscape that, despite a marine west coast climate comparable to Seattle or Portland, was no less barren than the Atacama Desert. At a time when Chile received few foreign visitors, I saw nobody else even along the trail's wooded lower slopes, slept in a comfortable national park shelter, and soaked in rustic thermal baths, all the while photographing sights such as the geometric fumaroles and massive lava flows left by the eruption nearly two decades earlier. 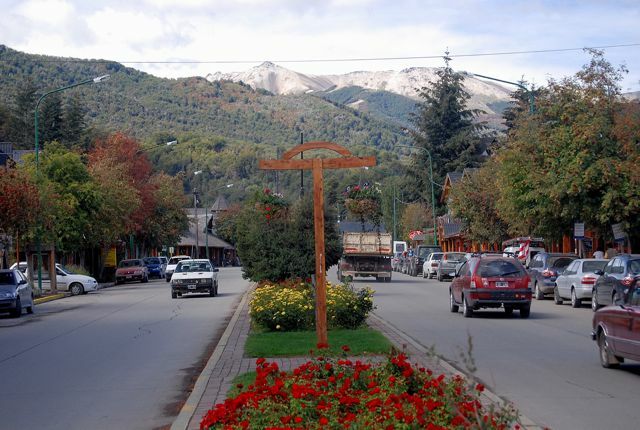 Since I did it, the Puyehue trek has acquired a certain popularity for its scenic grandeur and its easy accessibility on the international highway from Osorno to the Argentine lakes district resorts of Villa La Angostura and San Carlos de Bariloche. At the moment, though, this route is closed, and not just because of early winter snowstorms. On Saturday, the Córdon Caulle erupted with pumice and ashfalls that forced the evacuation of some 3,500 people, and closed the highway between Chile and Argentina (some footage on Chilean TV showed policemen hefting stones of lightweight pumice now scattered along the road over the Andes). Guests at the historic Hotel Termas de Puyehue, a classic hot springs resort within Parque Nacional Puyehue, were among the evacuees. According to MercoPress, the ashfall has also left Bariloche beneath a film of gray; city residents were advised to stockpile water and wear surgical masks if they needed to go out, to avoid breathing the ash. 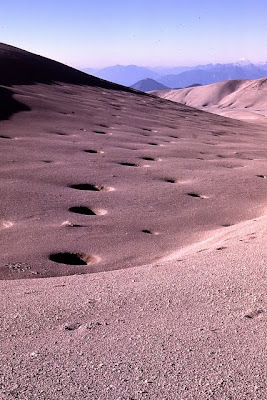 Parts of Argentina’s Ruta 40 were 30 centimeters (about 12 inches) deep in ash, making driving inadvisable. 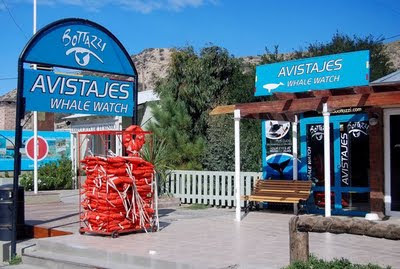 It also obliged Argentine authorities to suspend flights and close airports at Bariloche, San Martín de los Andes, Neuquén, Esquel and even the Atlantic coast city of Trelew. Originally, the column of steam and ash reached an altitude of ten kilometers (roughly 30,000 feet) but, as of Sunday, it had subsided. Presuming it continues to subside, the economic disruption should be minimal but, if it continues, it could have a high cost. 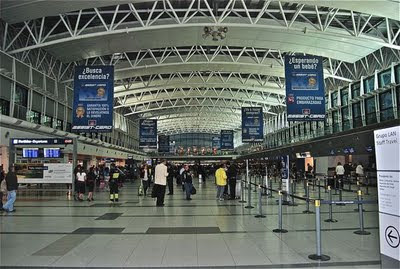 After the Libertadores pass between Santiago and Mendoza, the Cardenal Samoré pass is the second-busiest border crossing between the two countries, both for commercial and tourist traffic. Many Chileans spend the weekend across the border but, more importantly for Bariloche, Villa La Angostura, San Martín de los Andes and Esquel, ski season is about to begin. If flights from Buenos Aires and Brazil can’t land anywhere in northern Argentine Patagonia, it won’t matter how much snow falls at Cerro Catedral, Cerro Bayo, Chapelco and La Hoya. 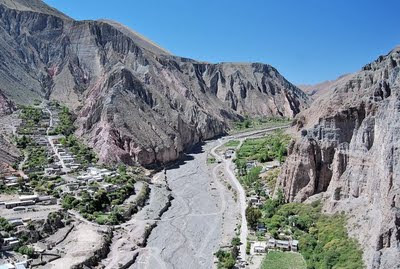 Today’s entry deals with several items on Chile, including former president Salvador Allende, his birthplace of Valparaíso, and the controversial HydroAysén dam project in Patagonia. In the more than 40 years since his rise to power and subsequent death in a military coup, former Chilean president Salvador Allende Gossens has been one of the most polarizing figures in the country’s history. Over the last several years, there’s been a consensus, based on testimony from his personal physician, that Allende killed himself rather than surrender to his military opponents. 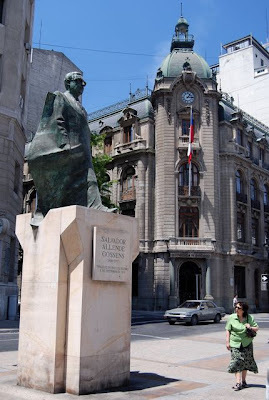 In the year 2000, the government of president Ricardo Lagos dedicated sculptor Arturo Hevia’s monument to Allende (pictured above) at the southeast corner of Santiago’s Plaza de la Constitución, opposite the presidential palace. This week, though, Chilean authorities exhumed Allende’s body from its resting place in Santiago's Cementerio General for an autopsy that would determine whether, or not, the former might have been executed by the soldiers who stormed the palace. This morning, TVN (a public TV station) suggested that Allende was indeed executed, though the Allende family - including his daughter Isabel (a cousin of the novelist of the same name) - castigated TVN for speculations in advance of the results. This week, in part because of the news, I watched the DVD of director Patricio Guzmán’s film Salvador Allende (2004). I regret to say that, after the artistry of Nostalgia for the Light , about which I wrote recently, it’s a huge disappointment - rather than a true documentary, it’s a 100-minute hagiography for someone who was no saint. Guzmán clearly idolizes Allende, an unquestionably interesting figure, and apparently made no effort to interview anybody from the opposition - and by the opposition I don’t mean the military thugs who overthrew him, nor the few Chileans that Guzmán shows spewing verbal venom in archival footage. Rather, I mean the political opposition who had serious misgivings about Allende, rather than just his friends and followers. Allende spent more than 20 years in the Chilean Senate, and it would have been revealing to hear from legislators who worked with and against him, in the same institution. For instance, former President Patricio Aylwin (still alive today at age 92) succeeded Allende as president of the Senate and led the democratic opposition within Congress. The interviews with former US ambassador Edward Korry are informative in revealing how Richard Nixon did everything possible to undermine Allende’s government, but Korry’s time on screen only suggests that Guzmán was simply looking to vindicate Allende by painting his enemies as villains. In the case of Nixon and his Machiavellian aide Henry Kissinger, this was not difficult. One of the distinctive features of Chile’s UNESCO World Heritage Site of Valparaíso is its assortment of ascensores , the picturesque funiculars that connect many of its hills neighborhoods with the financial and commercial districts along the city’s waterfront. 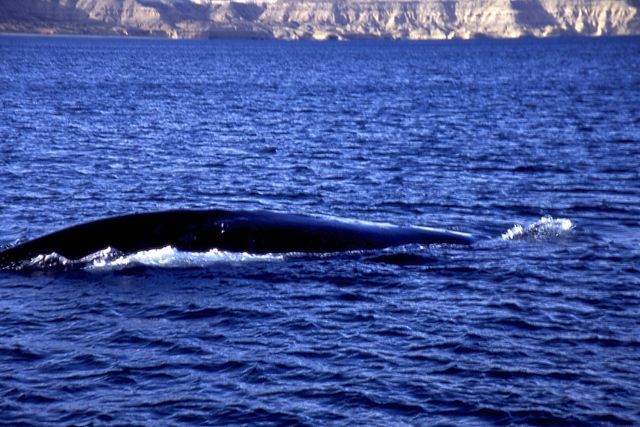 At one time, nearly three dozen of them shuttled up and down the precipitous hillsides and, just a couple years ago, more than a dozen still did so. 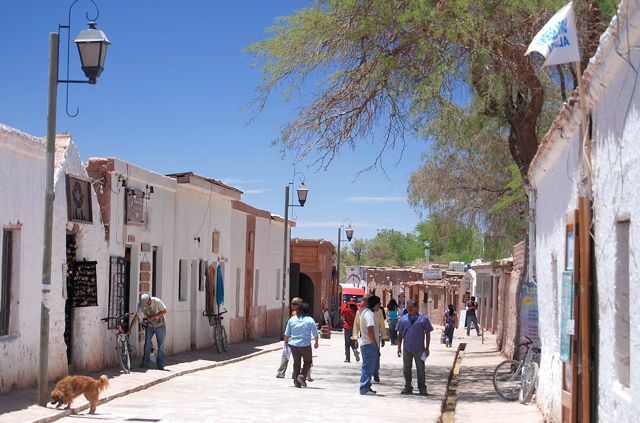 Though they give Allende's birthplace much of its character, many of them are privately operated and, unable to turn a profit, have closed. Under municipal control, only half a dozen still function but, according to an email I recently received from Martin Turner of The Yellow House B&B, the government will by August purchase ten of the privately operated ones that are still in near-working condition. 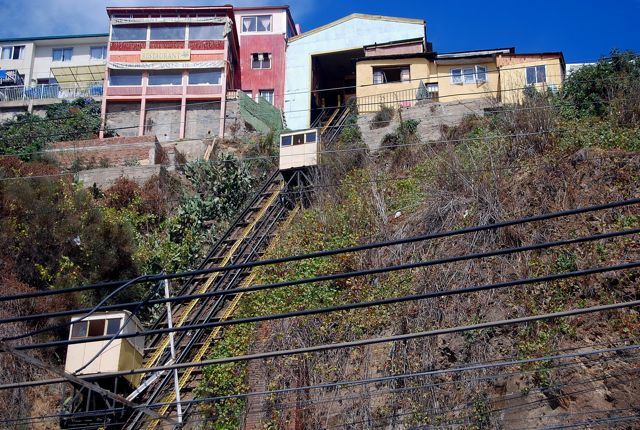 According to the online Santiago Times, Valparaíso’s Cámara de Comercio (Chamber of Commerce) is planning a series of restaurant developments near them, beginning with the neighborhood around Ascensor Barón at the east end of downtown. 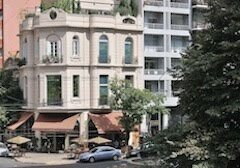 Presuming this development is done tastefully, in accord with UNESCO guidelines and the city’s traditional architecture, it will make historical preservation profitable as well as aesthetically pleasing.